Going through a dry patch on your freelance or contracting career? Read seven tips to help you be kind to yourself and take positive action. Something that’s familiar to pretty much every contractor or freelancer is the feast/famine cycle. One month you’re turning business away, the next you struggle to fill even a day with paid work. While you’re going through a dry patch, it can be easy to forget why you decided to start contracting or freelancing in the first place – and even to doubt your ability to find work. So it’s important to find ways to be kind to yourself, and take positive action to make the most of quiet times. Janna Beeching from Intouch Accounting works with contractors and freelancers every day. 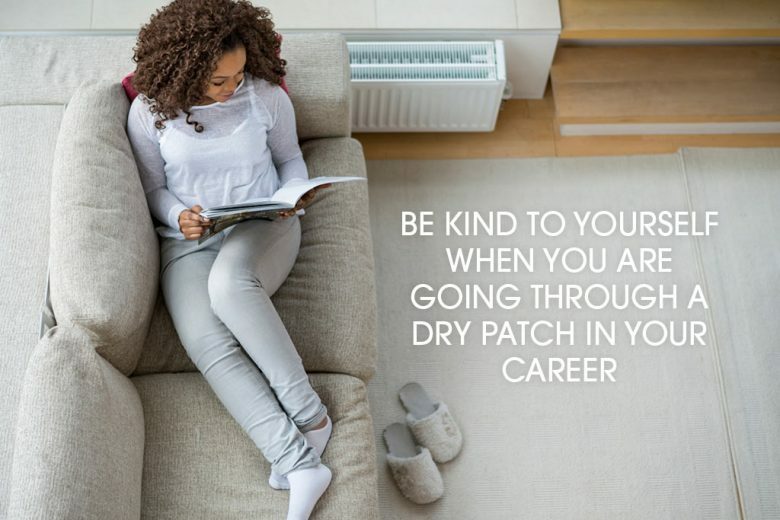 Here she shares seven useful tips to remember, should you find yourself in a dry patch and questioning your career choice. This might be the oddest tip to start a blog off with, but if you’ve been particularly excited about a certain contract that, out of the blue fizzles out, it’s understandable to be disappointed. But don’t let it darken your passion for contracting. Let the client know how excited you were to work for them and if the contract should be re-explored then you’d love to be considered once more. Also have a think about what attracted you to that particular contract and see if there’s anything else similar out there. Whilst friends and family are fantastic in supporting you when things don’t go to plan, it can sometimes be difficult for them to understand the world of contracting if they don’t also work within the industry. Ensure you have a network of contractors around you who you can speak to and express your feelings. Also remember to be there when they need your support! It works both ways. Socialising may be the last thing you feel like doing when going through a dry patch, but attending a networking event with other contractors could be the best thing for you. You’ll get to meet other contractors who could potentially open doors to new contacts and contracts for you. You never know, they could be looking for someone with your exact skills right now. This can be going for a walk, meeting a friend for a coffee, or even going for a dip in the ocean (if you’re feeling adventurous!). Whatever your simple pleasures are, make sure you do a couple of them when going through a dry patch. They’ll help you keep motivated and your mind positive. Beating yourself up over a lost contract is easier than accepting that its termination was out of your hands. But while this can be a negative of contracting, remember this also happens all the time in permanent employment – just in a different context. People get laid off and projects are cancelled, so it’s not just contracting that doesn’t guarantee anything. Catch up on your correspondence, update your marketing and business website and use your time to see what other contractors are up to. Your future busy self will certainly thank you for all the work you put in now. If you’re experiencing a dry patch it’s easy to feel like going back to permanent employment, so take a little time every now and then to remember why you took the leap into contracting. And let’s face it – moving to the beat of your own drum is so much better than someone else’s! We all have our down days and can feel like a lack of contracts or freelance projects is the end of your career, but remember that it’s worth riding out the storm to see the rainbow at the end. Janna Beeching works for Intouch Accounting, the expert contractor accountancy for Limited Company contractors.